Ubuntu has become popular not only among desktop users but also among the web developers who uses Linux distribution to deploy their web application (on a VPS or dedicated host), although they preferred to use LTS (Long Term Support – typically of five years for Server Edition) version rather than a regular stable release because of obvious advantages – increased stability (Although, from the next release i.e Ubuntu 12.04 LTS, Desktop version will also get 5 years of support). Despite of that fact, a lot of users/developers also use Apache server on their localhost for testing/development (e.g wordpress developers use it) and this post is written for those who want to get started with Apache, PHP, MySQL, phpMyAdmin etc with Ubuntu 11.10. Apache is the most popular web server on this planet (total share is above 65%). It is an open source and cross-platform web server. Apache supports a lot of server side language and the features is extensible using modules. PHP dominates the web scripting world and MySQL is the most popular open source database. Most of the websites (including the blog – you’re reading right now) are based on the great combination of Linux, Apache, MySQL and PHP (Commonly called as LAMP). and enter the root password during installation procedure. I’ve already covered a post in detail about how to install MySQL on Ubuntu 11.10. That’s All.. Linux (Ubuntu is itself a Linux based OS), Apache, MySQL and PHP i.e all the components of LAMP has been installed successfully. To manage MySQL database from a GUI, You may like to install phpMyAdmin – The MySQL web administration tool, a great application for managing – creating and maintaining MySQL database. How to install phpMyAdmin on Ubuntu 11.10 ? 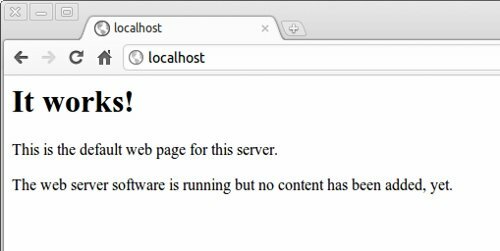 When the installation is complete, move on to http://localhost/phpmyadmin and login (using the MySQL login username(default is ‘root’) and the password (you entered during installation)) to start using it. Want to learn web server administration (with LAMP) on Ubuntu Server ? Having apache, MySQL, PHP installed locally on your system is good for learning about the server administration and other cool/great stuffs related to Linux but VPS is very cheap these days so you may want to try Ubuntu (with Apache or other web server) on a VPS for much better (and real) experience – I’ve been using Linode VPS @ $19.95/month (512 MB RAM, 20 GB space and 200GB bandwidth) for a while, and I am loving it. Apache HTTP Server i.e apache is a cross-platform open source(Under Apache License) web server software.Apache is written in C language.Apache is the most popular web server used(share on the web is more than 66%) for serving both static and dynamic web pages;as well as the features and functions that is required for most of the web applications.Apache supports a lot of features out of which some implemented in the form of compiled modules for extending the core functionality.A lot of server side programming languages is used with apache – Perl,PHP,Python,Tcl.Other security related features includes SSL(Secure Socket Layer),TLS(Transport Layer Security).The aim of this post is to explain you about installing apache web server on ubuntu 10.04 lucid lynx. Open Terminal(hit CTRL+ALT+T) and type the following command(s) ..followed by your ubuntu login password. and the installation procedure will complete within a minute. NOTE : You can also install apache from Synaptic Package Manager(SPM).Just search for ‘apache’ and select the package from result,then click on apply to install.Another and more common way to install apache is to install it together with PHP and Mysql ..in LAMP.